Hiya guys! 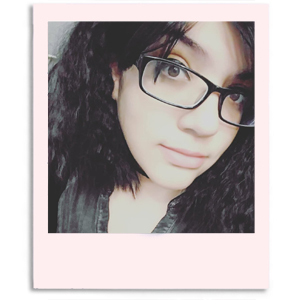 I'm back, kind of. The back pain I was experiencing went from zero to hundred over night pretty much. So one ER visit and a week of Percocet later I'm finally able to blog. Kind of... But I'll be talking about that in another post. 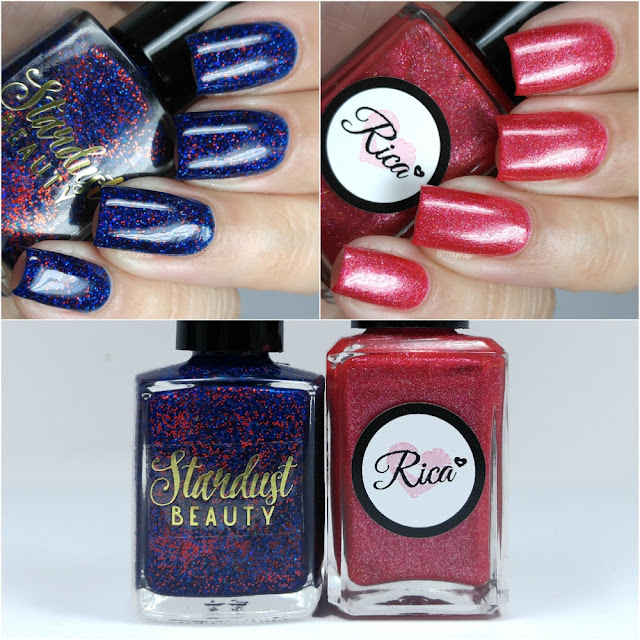 For today I'm sharing swatches for the December 2016 G.N.O.M.E Box, which this month only features Rica Polish and Stardust Beauty. Unfortunately this seems like it'll be the last Gnome Box as Stardust Beauty has announced her shop will be closing at the end of the month. You guys have no idea how heartbroken this makes me, Stardust Polish was my first indie purchase/obsession. This is definitely not a box to miss out on, so let's get to the swatches. The December 2016 G.N.O.M.E Box is now available for pre-order through Monday, December 12th at 8PM EST. There are only 100 boxes for pre-order, so it can end early if the cap is reached. Each box contains two full-size polishes and retails for $16.00 plus shipping (will ship worldwide). Christmas with the Gnomes can be described as a shimmery candy apple red with gold and red shimmer. I love how jewel toned the shimmers make this shade! Perfect for the holidays and honestly just the right hue to wear anytime. The formula has a great smooth application with good opacity. It builds up without visible brush strokes in the finish. Shown here in two coats and sealed with a glossy topcoat. This Gnome Is A Scrooge can be described as a cobalt blue jelly with red and blue glitters. 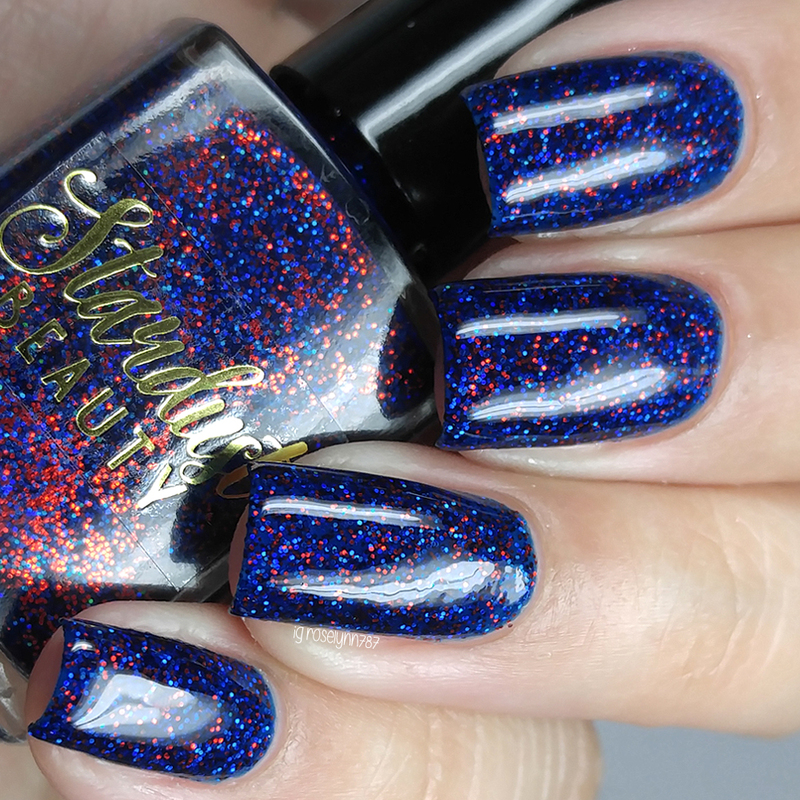 Oh my gosh, this glitter combination is stunning (look at how gorgeous it even looks in the bottle)! The red is really vivid against the blues, really my photos don't do it justice. The formula has a sheer application as expected for a jelly. It has a great consistency so it builds up easily for full coverage without the need to dab. It dries to a really textured finish due to all the glitters. I ended up using double topcoat to smooth it all down. Shown is three coats sealed with a glossy topcoat. To recap, the December 2016 G.N.O.M.E Box is now available for pre-order through Monday, December 12th at 8PM EST. There are only 100 boxes for pre-order, so it can end early if the cap is reached. Each box contains two full-size polishes and retails for $16.00 plus shipping (will ship worldwide). These are absolutely flawless!! I'm so sorry to hear that you haven't been feeling well; I'm sending positive wishes and vibes your way! I was so sad to hear that she was closing. I'm going to miss all these brands that have recently closed up shop. I hope you start to feel better soon. 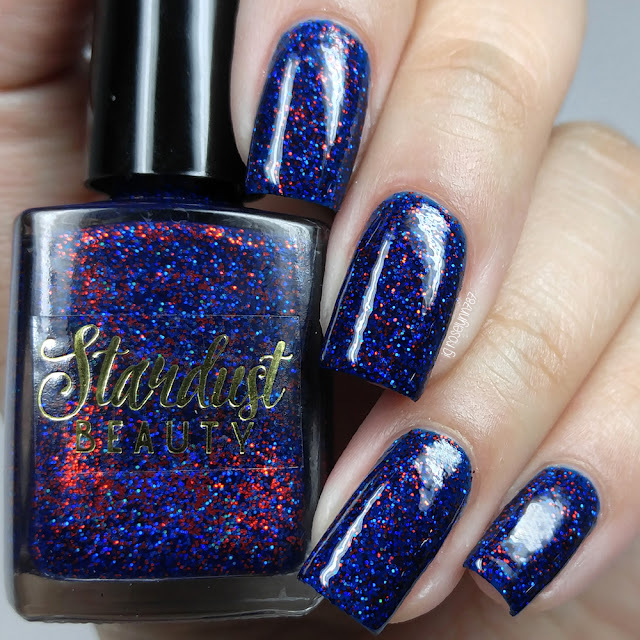 Too had about Stardust because the Polish is gorgeous. Back pain is the worst! I really hope that you're feeling better. Another indie going away before I even got to try them out!